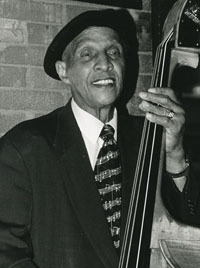 Oscar “Lucky” Wesley, a longtime bass player and vocalist with local jazz legend the Scamps, died March 27, 2010 at age 82. While Wesley played with many Kansas City groups and musicians, his principal legacy was with the Scamps, the Kansas City jazz band that has operated in various incarnations since the mid-1940s. “To say that you were a Scamp meant something,” Wesley told a Kansas City Star reporter in 2002. Wesley joined the band in 1971. With his stand-up bass, Wesley helped establish the swinging Kansas City signature that fans of the Scamps sought them out to hear. Wesley’s grandson Phillip Wesley, who has served as the Scamps’ business manager since his grandfather grew ill, vouched for the sound as well. “He really wasn’t into the technical kind of playing, where you play these big long solos,” he said. “But he would create this really big sound, like he wanted the audience to be able to feel it. “Anytime Lucky was playing the bass, you knew it, because he really knew how to make his sound stand out.”Wesley’s death removes from the Kansas City jazz community a musician who was well aware of the celebrated tradition he was working in, said Chuck Haddix, local jazz historian. “Lucky Wesley came up right after the golden age of Kansas City jazz, and he really carried that torch,” Haddix said. “The ‘Kansas City style’ always has been traditionally defined by the rhythm section and the bass line, and he very definitely had that distinctive Kansas City beat,” said Haddix. The sound thrilled him. After leaving the military, he came home to Kansas City and formed a group called the Five Aces, which, he once said, often tried to duplicate the Scamps sound. In 1950 the Five Aces appeared before about 8,000 people who filled Kansas City’s Municipal Auditorium to hear a lineup of local entertainers headlined by comedian Bob Hope. After the Five Aces disbanded in the mid-1950s, Wesley joined Kansas City pianist Jay McShann’s band. But he grew weary of the road and returned to Kansas City to find steady work with the U.S. Postal Service. He also joined the Scamps and for decades pleased audiences with his stage presence. “He was very charismatic, and had a smile that lit up the room,” said Tim Whitmer, who hired Wesley in 1992 to play with his band, Tim Whitmer and the KC Express, at the Phoenix Jazz Club in Kansas City. “One of the things Lucky taught me was a great appreciation for the audience,” Whitmer said. “He was always into having the people have a great time. Lucky had played with all the cats and he had that groove and that million-dollar smile. Philena Wesley, the musician’s daughter, believes that her father received the nickname “Lucky” from an incident that occurred while he was serving in the military. “He was originally a trumpeter,” she said. “But he was playing at a show, and he went to sing and somebody hit the microphone and it hit him in the mouth. He couldn’t play the trumpet anymore and he taught himself the bass.” How was that lucky? Perhaps because the bass was the instrument played by an idol of Wesley’s, Walter Page, who had performed with Count Basie.